On Thursday Sheryl and I will do what most Americans will do when we gather with our family to celebrate Thanksgiving. No one is certain when or how the custom began, but most accounts trace the day’s origin to Plymouth Colony in present-day Massachusetts, when in 1621, following a brutal winter, some Pilgrim settlers celebrated their survival, joined by a few neighboring Native Americans. More than 200 years later, in 1863, President Abraham Lincoln declared the last Thursday in November a national day of thanksgiving. It took Congress until 1941 to make the holiday official, now set on the fourth Thursday of the month. Days of thanksgiving go back further than 1621, of course. Someone identified a place in Texas as the site of the first Thanksgiving feast eighty years earlier, in 1541. The first mention of a thanksgiving offering in our Judeo-Christian tradition is in a legal code (Lev. 7:12-15) first written down more than 3,500 years ago, but it’s probably much older than that. At almost the beginning of the human story in our scriptures, Cain and Abel were offering sacrifices to God, although the purpose of their offerings is not clear to us. Thanksgiving is an ancient institution. The psalms express every emotion you and I have ever felt – fear, regret, anger, sorrow, wonder, grief, guilt, tenderness, you name it – and along with all those emotions there’s room for plenty of thanksgiving. In the 150 psalms we have, thankfulness appears seventy-eight times. Eight of the psalms are specifically psalms of thanksgiving: 30, 32, 34, 40, 74, 107, 116, and 118. “Sing praises to the Lord, O you his faithful ones, and give thanks to his holy name” (Ps. 30:4). While it’s right to set aside a special day each year for offering thanks to God, it’s not right to think we’ve done our duty by offering thanks only one day a year, especially when that one day has grown so burdened with self-indulgence as ours has. 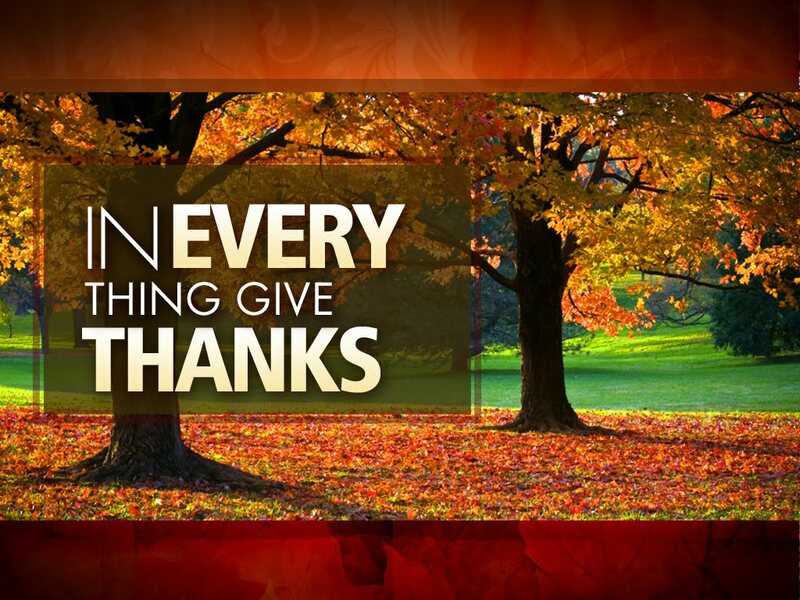 “Give thanks in all circumstances,” an ancient scripture encourages (1 Thess. 5:18), give thanks all the time, and that’s where it gets both difficult and real. Sometimes I don’t feel thankful. Most of the time, I confess, I’m so immersed in ordinary life, and sometimes so burdened by it, I don’t even think about giving thanks. Then some little example of blessing will catch my eye – a flash mob playing Beethoven in a public square in Sabadell, Spain, for example – and tears of joy and gratitude will come to my eyes for reasons I can’t explain, and I’ll recall how many simple little reasons there are for giving thanks always. But thanksgiving is not about how I feel. Thanksgiving is often linked with emotion but is not dependent on emotion. It’s not about how I feel; it’s about how I act: Thanks-giving. I give thanks, I offer thanks. Maybe that’s why thanksgiving in the Bible is so often mentioned in the context of offering sacrifice. “What shall I return to the Lord for all his bounty to me?” the psalmist wonders. “I will pay my vows to the Lord in the presence of all his people” (Ps. 116: 12, 14). In other words, I give thanks by doing what I’ve promised God I will do. By renouncing the spiritual forces of wickedness, rejecting the evil powers of this world, and repenting of my sin, as I did last week when we reaffirmed our baptismal covenant, even when the forces of evil are so ingrained in the habits of my society I hardly if ever notice them. By resisting evil, injustice, and oppression in whatever forms they present themselves, even when they present themselves in forms with which I am familiar and comfortable. I do what I’ve promised God I will do by living according to the example of Christ, especially when doing so means I have to take up my cross and live in opposition to the values my neighbors take for granted. I do it by supporting the church, sacrificially, with my prayers, my presence, my gifts, and my service, that in everything I do, in every part of my life, God may be glorified. Thanksgiving is not how I feel; it’s what I do, it’s hard work, and it requires difficult choices. Have you noticed how Jesus gives thanks when he is about to give something to someone else? He gives thanks before feeding the multitude (Matt. 14:19; 15:36), serving the needs of others with the resources God entrusted to him. He gives thanks before raising Lazarus from the grave (John 11:41), using his power in life to restore life to others. He gives thanks before giving his body and blood to his disciples (Luke 22:17-19), offering himself as a sacrifice so others would have the fullest of life. What do those things look like in my life? In yours? Here in the Williamsville congregation, fulfilling our vows to God and giving thanks looks like giving some of our resources to those who have great need. We do that all year, but now we’re more conscious of the need and more intentional in doing something about it. Don’t underestimate the value of providing even one meal to a hungry family. Such acts of generosity, according to Jesus, are examples of how our lives will be judged worthwhile in the end (Matt. 25:31-46). But things are not what God needs. Every possession we could offer to God already belongs to God. “If I were hungry,” God says, “I would not tell you, for the world and all that is in it is mine” (Ps. 50:9-12). What God desires from us, the psalmist says, is “truth in the inward being” (Ps. 51:6) – honesty, with ourselves as much as with anyone, and genuine humility. “The sacrifice acceptable to God is a broken spirit; a broken and contrite heart, O God, you will not despise” (Ps. 51:17). God wants us, our true and authentic selves. God wants us as the original person God is creating, not the person who has been adulterated and compromised by the mere world around us. In his book The Clown in the Belfry, Frederick Buechner put it this way. So let’s really give thanks this year. Let’s give enough of our resources to force a change in our lifestyle as we conform ourselves to the example of Christ and serve the needs of others. Let’s give thanks in a way that facilitates the ministry of reconciliation, reunion with those from whom we are disconnected or estranged. Let’s give thanks by giving ourselves, our true selves, in love for the world.